:: steph chows ::: Want to win a Lipton Gift Basket? 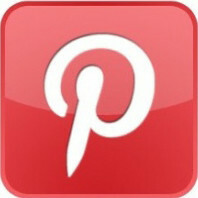 Want to win a Lipton Gift Basket? I do I do! Ok I didn't win one, but I GOT one from the wonderful people at Lipton because this girl here is one of their new tea tastemakers!! And the best part is YOU, one of my wonderful readers, get to win one! 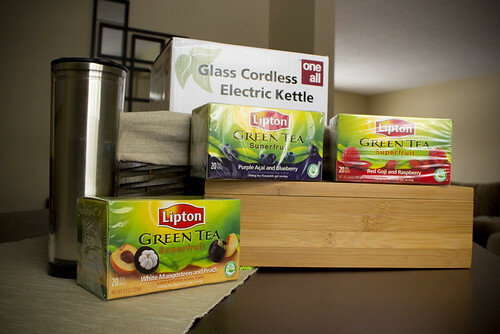 The basket includes: an electric tea kettle, 3 boxes of lipton tea, a travel tea tumbler, and a very cool bamboo tea box. Details on how to enter below. I seriously drink at least 6 cups of tea a day at work, it's my lifewater. Just ask my boss, he always manages to page over to my desk when I'm in the kitchen heating up water. 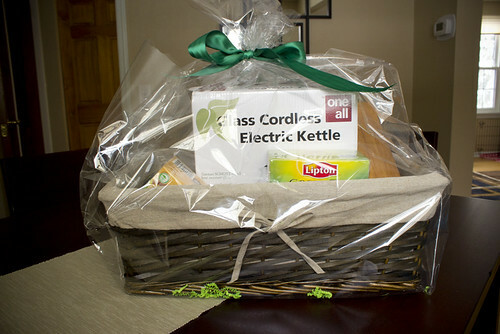 Best part, I don't need to use the microwave anymore because the gift basket comes with an electric tea kettle! I'm normally not a huge fruit flavor tea kinda girl, I'm a straight up green tea, nothing added gal, but I must say I'm really digging the green tea with goji and raspberry the best. It's a subtle taste, and has a really nice aroma. The mangosteen peach is perfect for you fruity tea lovers (it was a bit too peachy for me personally). How to enter: Tell me how you like your tea: Sweet? With lemon? Straight up? (entries limited to US only, sorry my international peeps). You have until March 13th noon EST to enter. Sun tea with lemon and sugar, please! I'm a big fan of Chai tea. But right now I'm sipping on a peppermint tea with one sugar! I like my tea with just a little bit of sugar. Delicious! Sun tea straight up and hot tea with milk and maybe a litter sweetener. Hi Steph, I've been gone far to long and glad to be back for a visit! Hope your day is delicious! electric tea kettle? um cool. I love all kinds of tea. totally depends on my mood. Southern sweet tea! Or green tea. Or lipton regular tea with lemon. I love them all! *swoon* you had me at tea! My goodness...I drink anywhere from 3 to 12 cups a day (no seriously). How I drink it depends on the kind - normally just straight up and pretty strong, but i am a sucker for a good earl grey with milk and sugar. So nice to see you back too!! I like most teas with just lemon, no sweetener. Chai is the exception. It needs some milk and sweetness. I love green tea with mint or green tea with ginger. Adds a bit of zing! i prefer my tea plain--nothing added...and i only like it hot! I drink my tea with a little bit of stevia in it (but not too much!). it depends! "warm" flavors (like french vanilla and apple cinnamon) I drink au naturale, but fruity flavors (like peach or raspberry) I need a little sweetener. i like my tea as you do ... straight up! Like my tea straight up.. Tension Tamer is my favorite! Big tea drinker! Straight up and iced green tea every afternoon. I love any kind of tea, really.. green, earl grey, chai, fruity, black.. unsweetened! I prefer hot black tea, among those English and Irish Breakfast with a little bit of raw sugar and milk or cream if available. Best way to start a day ! I like my tea with honey! I have my morning tea with sugar and I SO need a tea kettle! I love trying new tea, depending on the type I drink it plain or with a healthy scoop of honey. With honey, sometimes lemon. Mostly just lots of honey. I love how syrupy it gets at the end.